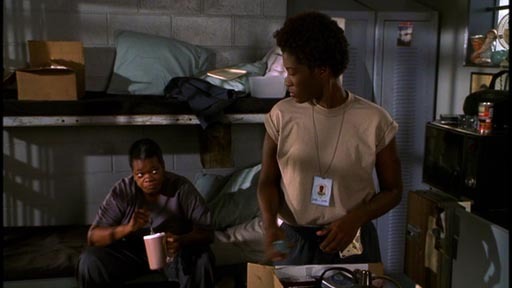 Quick Answer: Before Orange is the New Black, HBO aired Stranger Inside (2001), a movie about a young black woman’s life in prison directed by black lesbian feminist director Cheryl Dunye. We can compare the two in terms of their representations of diversity in race, class, gender, and sexuality, but when considered together they also speak to larger cultural questions related to the lives of women of color, both on screen and off. Unlike the B women’s prison films of the 1950s and the sexploitation flicks of the 1970s (discussed here), contemporary Hollywood has shifted to television programming to address the lives of women behind bars with far more political and feminist awareness. Evidence of success in the prison theme appeared through ITV’s Bad Girls (1999-2006) overseas and HBO’s Oz (1997-2003) on the subject of men in prison. Orange is the New Black (OITNB) was a natural choice for Netflix and its small but growing number of original series. OITNB was based on Piper Kerman’s popular memoir and created by Jenji Kohan, who had already explored the topic of bad girls and drugs in the quirky and highly successful Weeds (2005-2012) for Showtime. The combination of creator and subject matter seemed to promise another sure-fire hit for Kohan as well as star Taylor Schilling, playing Piper Chapman, a privileged white woman becoming acclimatized to life behind bars. Before OITNB, however, there was black lesbian feminist director/writer Cheryl Dunye’s HBO film Stranger Inside (2001). Stranger Inside tells the tale of Treasure Lee (Yolanda Ross) a streetwise criminal looking for her mother, who is living out a life sentence for murder in the state penitentiary. Treasure gets herself put away intentionally, and plays it tough and confident until she has enough to trade upon to get to maximum security to meet her mother, nicknamed Brownie, a cold sadist who has learned to work the system. Both mother and daughter are lesbian, both butch and arrogant – though we get to see Treasure’s vulnerability from time to time, especially as relates to her mother. Racial tensions within the prison are black vs. Latina regarding the drug trade, while there is also a group of white supremacists who seek strength against non-white women through numbers. Significant to this tension is that Brownie’s closest drug runner “daughter” is a white woman named Kit (Rain Phoenix). There is both attraction and tension between Treasure and Kit, but all is revealed to be purposeless when Treasure offers to donate blood to help Brownie (after an ousted Kit stabs her in the neck), only to learn that Brownie is not her mother but her mother’s killer. The film ends with Treasure turning state’s evidence against Brownie and returning to minimum security to finish her sentence, having learned little other than to trust even less. As in OITNB, there is diversity in the cast of Stranger Inside, especially among the African American characters, including Shadow (LaTonya T. Hagans), a former member of the same gang as Treasure who is trying to do her time honestly and get out to start a new life; Leisha (rapper Medusa), a rapper who gets out of jail, only to be busted and returned within days for drug use; and Doodle (Ella Joyce), a Bible-thumping homophobe who is also having an affair with a married guard. Also as in OITNB, the political gives way to the personal and the emotional. Treasure’s abandonment as a child, life in poverty, and subsequent inability to make strong connections with her peers beyond a gang setting gives way to the melodrama of learning she has been cozying up and committing crimes (including drug running and beating others severely) for the sociopathic murderer of her mother. The shock value is more important than the social and even psychological issues, as is the powerful ending. 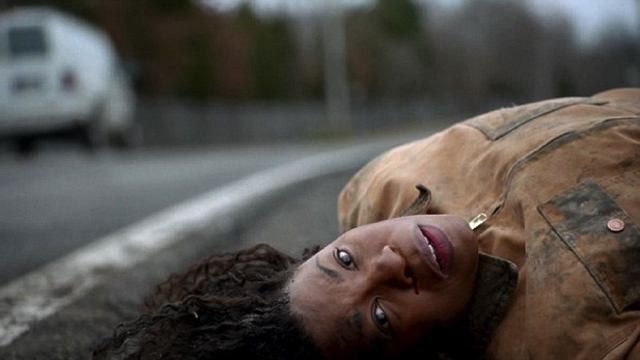 Similarly, although within a serial format, sociopathic Vee (Lorraine Toussaint) is dispatched with pleasure by Miss Rosa (Barbara Rosenblat) at the end of OITNB’s second season, being run over as she tries to escape with only a tossed-off “So rude, that one” as her epitaph. In season three, Poussey (Samira Wiley) kicks her alcohol addiction with minimal effort and her painful loneliness is ended as she takes up in season four with Brook Soso (Kimiko Glenn). Moreover, although Stranger Inside does not feature trans characters, its emphasis on lesbianism offers a welcome diversity in the women in prison genre that has been echoed in OITNB. Rather than fetishize, both the HBO film and the Netflix series straightforwardly offer sexual diversity. Brownie is the stoniest of stone butches, Treasure is a soft butch, as is Kit, and the lover they briefly tussle over is the femme Sugar (Patrice Fisher). Similarly, in OITNB we have the old school butch of Big Boo (Lea DeLaria), the opportunistically dominant Nicky (Natasha Lyonne), and the more femme Poussey. However, echoing contemporary notions of a more fluid diversity, we have the pansexual Soso (drawn to lovers regardless of gender) and the bisexual (attracted to both women and men) Piper. A documentary impulse arguably influenced both Dunye and Kohan, with OITNB inspired by Piper Kerman’s memoir, Orange is the New Black: My Year in a Women’s Prison, and the fictional narrative of Stranger Inside infused with actual women prisoners performing in several of its scenes (including powerful therapy sessions that are absent from most of OITNB). Why is diversity among women characters most shown in texts centered on prison? What does it say about contemporary America that a prison setting offers the best opportunity for black and Latina actresses seeking work in Hollywood? And, finally, can we truly imagine no other spaces in which diverse women actively interact? To my mind, posing such questions can help us to continue to appreciate all that both Stranger Inside and OITNB offer to the women in prison genre and television more generally, even as we probe the larger issues they raise.